Child 44, the new mystery thriller that is about the hunt for a serial killer in post-World War II Soviet Union, has received terrible reviews. I mean, horrendous in some cases. It’s at 25% at rottentomatoes. And very few, so far, have had much too good to say about it. Well, I’m here to suggest that maybe the movie is being a bit maligned. That is not to say I think it’s great. I definitely do not believe it quite succeeds on its own terms or rises above what it is. And it’s also possible that I went in expecting the worst, only to be pleasantly surprised. That’s certainly happened to all of us at one time or another. But still, I think there is much to like here, especially if you are a fan of neo-noir or crime dramas. First, from a technical standpoint, Child 44 is a ravishing movie. It’s big, it has incredible period detail, it has dynamic cinematography with huge vistas and epic frames of trains traveling through the countryside. It’s more that declares that it is a movie, and a well made one at that. At the same time, this, in one way, could actually be considered a point against it. As well made as it is, it may be too big for its more down to earth subject matter. But equally as riveting as the technical aspects is the subject matter. It’s 1953 Russia, under Stalin, after the mass starvation and pogroms and political cleansings that killed more people than Hitler. An M like monster is killing little children. But this is the USSR, an example to the world of a perfect society. The taking of innocent life, at least in this manner, is a capitalist fault. As a character says here and there, there is no murder in paradise. Our hero, Leo, is high up in the KGB and he’s very good at his job, though in a way that allows him to be sympathetic to the audience. In playing good cop, bad cop, he always manages to be the good one. But things start going wrong when the little boy of his best friend and fellow officer Alexie is found dead. The investigation claims he was hit by a train, and Leo is called upon by his superior, Kuzmin, to not just tow the party line, but to convince Alexie to do the same. But everyone knows that’s not right and they know why it’s being hushed up. And so we now have someone investigating a crime that isn’t supposed to exist in a world where even if you are as privileged as Leo, one wrong move, one slip of the lip, one tiny error, and you’ll be shot in the head. This is actually where the plot starts going a little wrong. Others have complained that it gets off on the wrong foot in the early scenes of Leo as a young boy in an orphanage and his running away and being taken in by some soldiers. But I found these scenes to be important to telling us who Leo is and what the society is like. No, everything is fine until here, what most screenwriters would call Act II. Coincidentally at this time, Leo’s wife, Raisa comes under suspicion as a political subversive and the two are sent to a remote industrial town, an exile from which no one ever returns. Now, if Leo and Raisa had been sent due to the machinations of a jealous and ambitious co-worker, Vasili, a sociopath who has locked horns with Leo before, and if Vasili had used Leo’s interest in the murder as an excuse, this might have worked better. But there’s no real indication that there is any sort of connection. At any rate, the story basically stops here and now has to be rebooted and because of that, the plot gets bogged down and has trouble getting going again. But it does eventually begin again with the discovery of another dead child near the railroad tracks in Leo’s new assignment. It seems convenient at first, and it is in a way, but it also makes sense since this is part of the killer’s MO and is a clue in identifying him. And during this period, as Leo does start up the investigation once more, the movie also gets overloaded with through lines of Leo and Raisa’s marital and relationship problems (she married him out of fear since he was in the KGB and now the two have to learn to love each other again), as well as Leo having to convince his new boss Nesterov to help him. 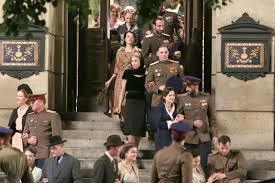 In addition, this leads to an extended set piece of Leo and Raisa sneaking back to Moscow incognito to track down a witness. The problem is that when all is said and done, these scenes feel unnecessary (though at the same time, they are, I think, kinda, sorta needed for the plot to work out a certain way) and not enough happens to be justified dramatically. And so much of this part is about people not investigating a murder they are trying to investigate. But the third part picks up again and becomes an exciting, if a bit over the top, action thriller with a rather satisfying resolution. Leo is reinstated and instead of taking a huge promotion, asks to be assigned as head of the Moscow Homicide Division. The irony is that he is allowed to, but the suggestion is that all murders, like the one they just solved, will be attributed to foreign agencies trying to undermine this paradise. In many ways, Child 44 is basically the first entry in a mystery series like Wallander, Fargo, True Detective and Broadchurch. And it might have worked a bit better if it had been made for television where the scale would be smaller and more fitting for the subject matter and the story could be stretched out over several episodes and the audience would be more forgiving if the plot stalls at times. It just doesn’t seem to fit the size of a movie screen. Child 44, though, is one of those movies with a stellar ensemble cast that you often more find in British films that in any others. I don’t know why, but British actors seem to have a special knack for bringing both larger and smaller characters to life and not bland them out. Tom Hardy is Leo and he plays the roll with a certain glint in the eye that lets you know that he knows the situation he’s in. He’s not stupid. He does his job and loves the position he is in, but he knows this position can change on a whim; in other words, he fully embraces the system, but he knows how betraying it is. Noomi Rapace is Raisa and it’s nice to have a wife character who is not just an adjunct to her man, but is fully developed on her own and is her own person. She also has the best line. When Leo says something to the effect, “Do you know what is going on”, she replies, “Yes, it’s our turn”. With Joel Kinnamen from The Killing as Vasili; Fares Fares as Alexei; Jason Clarke as a political criminal; Paddy Considine as the killer; Vincent Cassel as Kuzmin (in a roll that was to be played by Philip Seymour Hoffman); and Gary Oldman as Nesterov. Directed by the Swedish born Daniel Espinoza, who gave us the unfortunate Safe House, but the more fun Easy Money, which also starred Joel Kinnamen, and written by Richard Price, of Clockers, The Color of Money and Shaft, from a trilogy of books by Tom Rob Smith. The film was banned in Russia. I’m not sure why since it all takes place long before Putin and is inspired by a real life crime, but perhaps it still manages to hit too close to home. I’m not sure what is scarier: the movie Unfriended or that the central characters, a group of six high school friends, can navigate a myriad of social media networks at once with the dexterity of a Paganini while I have trouble e-mailing and being on facebook at the same time. Unfriended is a nifty, little, low budget shocker that is very well done. Which is perhaps one of the things that makes it truly unnerving. It if were made cheaply and with all the cheesiness of a B film, we could laugh it off. The fact that it is done so well, is so technically strong, the direction by the Russian born Levan Gabriadze so confident and assured, and the screenplay by Nelson Greaves so clever, and everyone else treating it as seriously as if they were doing Shakespeare, is what gets under our skin. The basic premise is that six friends who are skyping each other one night are hacked by an unknown presence who turns out to be a classmate who was so embarrassed by a video posted on facebook that she committed suicide. She’s back for revenge as she manipulates all involved to admit damaging secrets as well as their part in her suicide. The movie is well structured and has a really nice build. It all takes place on one computer screen, that of Blair, our hero, as she jumps from skype to e-mail to the web to…well, wherever (who knew that watching a computer screen and following a curser could be so suspenseful?). It also has one of those great moments out of Invasion of the Body Snatchers and I Married a Monster from Outer Space when someone calls 911. Some have criticized that it doesn’t quite play by its own rules when it comes to the deaths of those involved, and I can’t argue that. It is a fault. And as you realize that there is no solution to the problem, basically all you’re doing is watching one person die after another. Which leads to an aspect of the film that may even be more disturbing than anything else: just how nihilistic it is. I’m not sure when nihilism in horror movies began, but I’m sure Night of the Living Dead is a good guess. But when it came to ones involving teens, no matter how terrible some characters ended up, the virgin always lived to fight another day. But in this movie, as well as It Follows, there is no end game. There is no way out provided. So is this how the younger generation sees itself, as trapped in a hopeless situation from which there is no escape? The parts are played very ably by a set of relative unknowns and newcomers, the best known probably being Jacob Wysocki, who starred in the movie Terri with John C. Reilly.